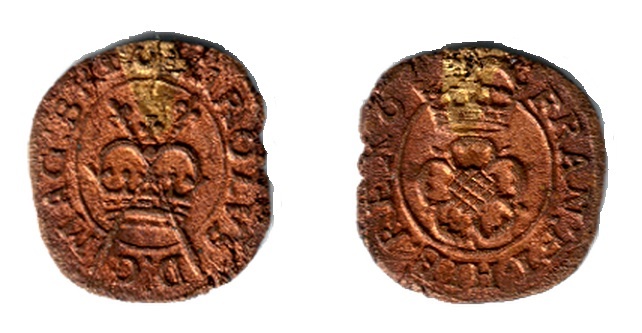 In 1636, directions were given to Lord Maltravers and Sir Francis Crane “to make a new sort of farthing token which should have a little brass in the middle of the copper to distinguish the true farthings from forgeries.” The harp on the reverse was replaced by a rose, and hence these pieces are known as the Rose farthings, and are the last made under the patent of Charles I, which was abolished during the interregnum. Consequently, Rose counterfeits are RARE. These Rose farthing was much smaller and thicker than the Maltravers, but the revolutionary development was the metal and construction of the coin; most of the coin was copper, but a small “plug” of brass was inserted into part of the coin. This made the Rose farthing an early example of a bimetallic coin and also almost impossible to counterfeit, and the production of forgeries soon ended. The reverse shows a double rose and the continuing inscription FRAN ET HIB REX — France and Ireland, King. These issues have inner circles on both sides of the coin, between the legend and the design element. The average weight of the Rose Farthing pieces is about 13 grains, ranging from 9 grains to 17 or 18. Exceptionally heavy pieces occur and are known to weigh 21, 25 and 26 grains. A brass wedge is also found on many examples, which was used to deter counterfeiting. It is believed that a rod of copper was produced with a notch in it, and then molten brass poured into the wedge, finally the rod was sliced to create the blank flans. After nearly 400 years, some of the brass plugs are now darker than the surrounding copper. 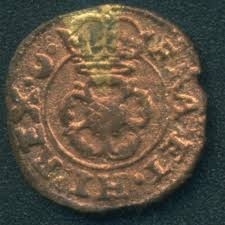 A rather small coin, at 13-14 mm,(though thicker and heavier) than the Maltravers (16-17mm) it replaced. The design is rather similar to the Maltravers with a (plain) inner circle. 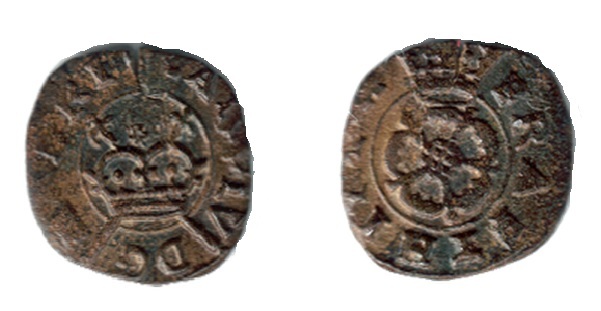 The obverse design features a chunky crown and sceptres, which lie entirely within the linear circle. The reverse depicts a crowned double rose, with the large rose touching the inner circle. Brass wedge at 12.00 o’clock. Privy marks may be on either, or both, sides. Both marks may appear on the same coin. One issue with lis/lis has no obverse linear circle. Die axis on all Roses is unrotated. This is a pairing of obverse type 1 with the reverse of type 2. One issue has pm=lis both sides but reads HIBER. Another has pm=lis on reverse only – but reversed N in FRAN. 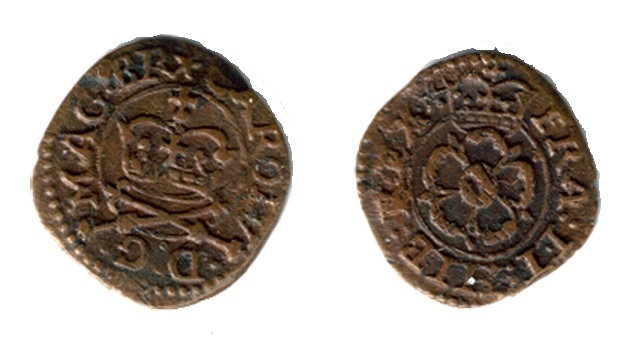 Type 1 obverse with its large crown paired with a type 3 reverse. Only one issue known and this has an error – namely HIBE. Much smaller emblems are used, with the sceptre handles through the tiny crown just crossing the linear circle. Lis is the only privy mark used and is found on both sides except for a couple of issues where it is omitted from the reverse, on one of which the legend reads HIBER rather than HIB. This group is something of a catch-all covering all Roses which cannot be slotted into types 2 or 4. 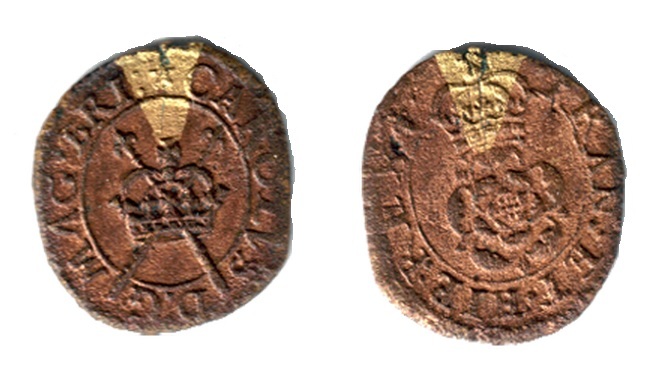 The obverse crowns – always double arched – can vary in shape and design, whilst the (double) rose emblem can also differ from one piece to another. BRIT and BRI are both used, and one issue reads HIBE. Privy marks known are – lis/none, none/lis, lis/lis, lis/cross patée, cross patée/lis, cross patée/none, lis/mullet, mullet/lis, and mullet/mullet. Various legend oddities occur such as inverted A for V, inverted V for A, over-struck letters, mis-spelled legends and misplaced punctuation. Apart from two very common issues – E.165a/P.305. lis/lis and E.172a/P.314. mullet/mullet, all coins of this type range from rare to excessively rare. This is the simpler design with single arched crowns both sides, a single rose, but still retaining the longer legends. Privy marks can be – lis/lis, mullet/mullet, mullet/crescent, crescent/mullet, and crescent/crescent. This last having a variety with the N of FRAN reversed., and others with distinctly rounded obverse crowns. All now read CAROLV DG MA BRI – FRA ET HI REX. 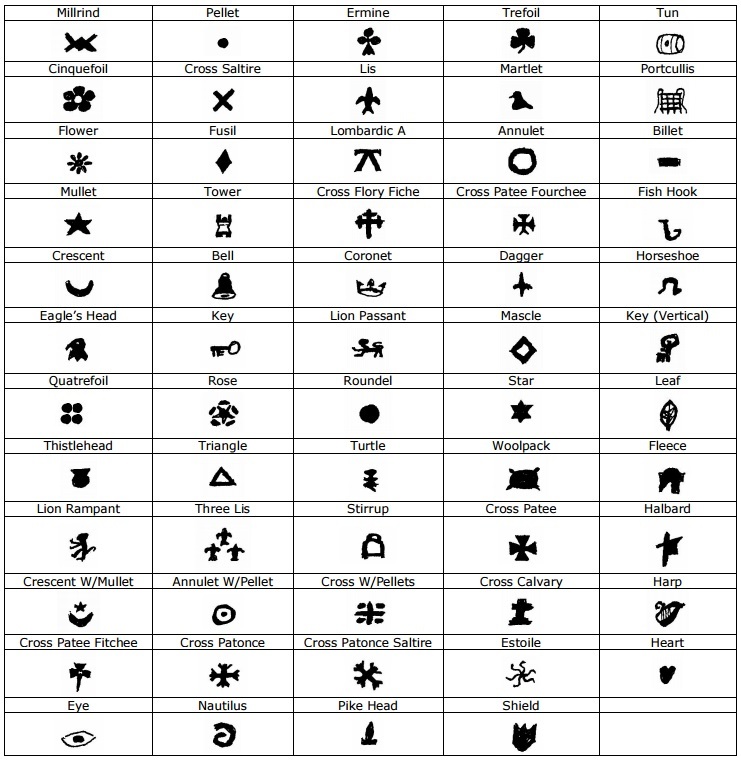 Privy marks are – mullet/mullet, crescent/mullet, mullet/crescent, and the EXR crescent/none. The final pairing – crescent/crescent – is by far the most numerous, and probably accounts for 80% of all Roses found today. Inevitably with such a long production run several striking errors occur, leading to letters being over-struck etc. One great rarity has an inverted A substituted for V in CAROLV. Combining 4b obverse with the type 3 reverse. Privy marks found are crescent/lis, crescent/none and crescent/crescent. Only the latter is common, the others being excessively rare. Some type 4 pieces occur with irregular legends. These can be – CAROLV MAG, MA OR M on the obverse. Also known are FRA HIB and FR HI on the reverse. All bear the crescent/crescent privy mark, except for one with mullet/mullet. This final series differs from all others in that the sceptres are crossed beneath the obv.crown. Type 5a having bosses on the sceptre handles. The legend reads – CAROLV D:G MAG BR and FRA ET HIB REX. Very similar to 5a with crossed sceptres below the crown – but now the handles are plain. Several combinations of legend occur, using – MAG BR, MA BRI or MA BR. on the obverse – twinned with FRA HIB, FRA HI or FR HIB on the reverse. Pm=mullet/mullet. One issue has an inverted A for V in CAROLV, whilst another has the cross missing from the central orb of the obverse crown. 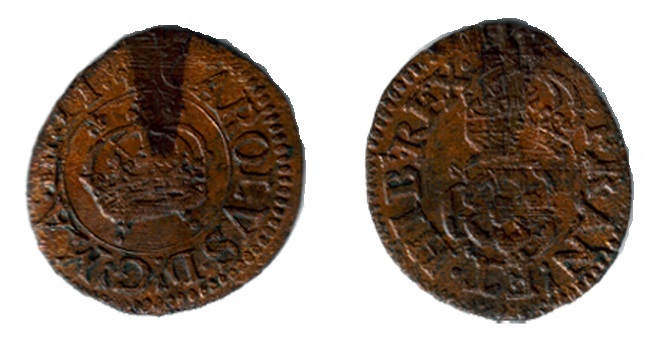 In line with the previous patent farthings, the Maltravers Rose Farthings included a series of Privy Marks which were an additional device to prevent / deter counterfeiting. The only deterrent that actually worked, however, was the insertion of a brass plug.